Justine and I are sat at the clubhouse bar sipping juice as the rumble of Toxic Rider's bike pulling in causes the window panes to shake. The door swings open like in an old western movie saloon and the mustached, tattooed, pierced biker walks in. He strolls purposefully toward us and extends his arm to shake hands before reconsidering, his brain ticking over about what to do next. 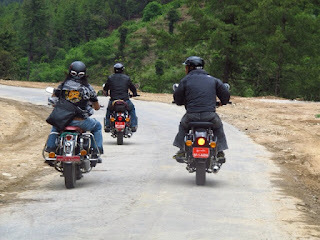 Were this the Hell's angels, the next thought may be starting a brawl. 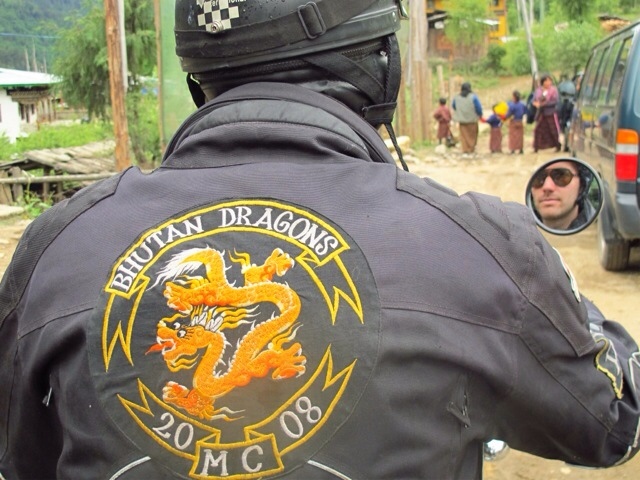 Since it is Bhutan's premier biker gang - the Dragon Riders, whose stated mission is to spread peace and support communities in need - he instead opens his arms wide and says to us, "your charitable work is a beautiful thing for Bhutan and the world." 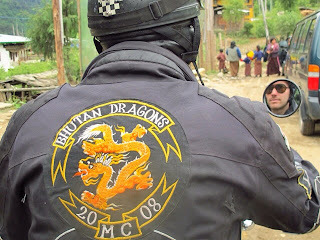 That's right, even the biker gangs in Bhutan are lovely. We are joined by the managing director of Bhutan Tourism Corporation Limited, the senior vice president of Druk Punjab National Bank, an unassuming man who turns out to be Bollywood's one and only Bhutanese artiste, and a Swiss guy named Chris who is ONE OF ONLY FOUR FOREIGNERS in Bhutan to have been granted citizenship. Where am I? Justine is assigned to ride double with the world famous Bollywood star without protest. 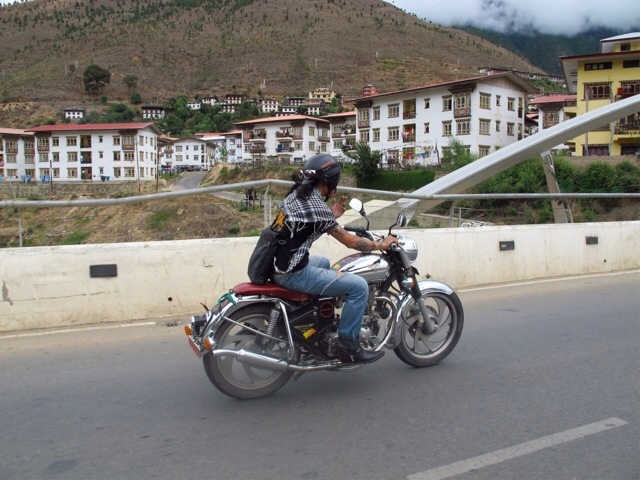 I am told I'll be riding with Tingle, the "Big Kahuna" of the gang who drives a gorgeous 500cc Royal Enfield. 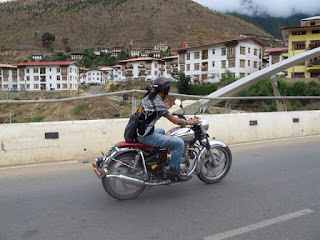 Before long we are zooming through the town centre at top speed (50kph) headed up, up, up to the summit of the main pass that joins this valley with the next valley to the east. It is clear that the community knows the gang. There are waves and honks accompanied by smiles and trucks pull to the side so we can pass. The higher we go the cooler the air becomes before we disappear completely into the mist. Between snapping photos and looks behind to make sure Justine is still there, I get to chatting with Tingle about anything and everything Bhutan. We have been here just 24 hours but, without question, I can't help but feel as if I don't have a clue as to what is going on. The mindset - the way people seem to approach life - is entirely different and I am curious in a way I haven't been in quite some time. We talk about financial wealth and culture, Tingle acknowledging that there are "better off" people and those that are a great deal more poor. The key to this being "better off" seemed to be entirely wrapped up in how much education one had received. What strikes me, however, is the difference in how Tingle and his fellow elite in the gang view their elevated status. "It means we are more responsible to do more for our country and we must work harder for our happiness. 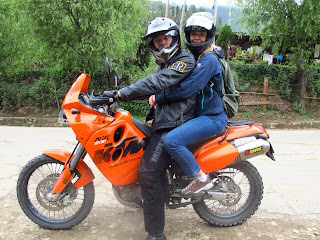 For example, ever since we started the charity biker gang our lives have been so blessed. We are earning life karma." The same topic came up over dinner with the Sales Manager - Vishal Pradhan- of the Taj hotel - a luxury five-star tourist property. He mentioned have been educated abroad and the main focus in Bhutan on education and health for all. I couldn't get out of the headspace of valuing education as a financial and professional advancement tool. "You miss my point," he said. "Education is about enlightenment, self-understanding, and happiness. That is the measure of educational success and, in turn, life success." On our way back from the pass Tingle shut off the engine and guided us down the steep road in neutral. "Listen to the silence," he told me. "This is true bliss. This is real life." 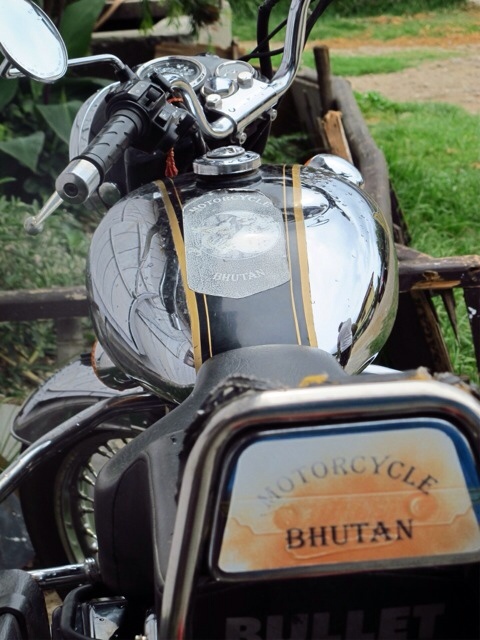 For the Bhutanese, it seems, this is real life. Viewing success through the lens of happiness, contentment, and service to others. Seeing education as the pathway to personal enlightenment and not material wealth. Taking a moment to listen to silence and remember how small you are in this giant world. Cheesy in the context of our norms? Yes. Worth attempting to rethink the entire frame? Also yes. To say this morning was a "life highlight" is a gross understatement. 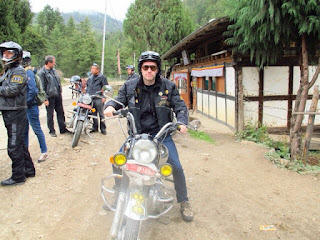 If not for the ongoing lesson in how to shift the entire way one views the world then at least for the awesome photos wearing embroidered leather jackets and looking tough.